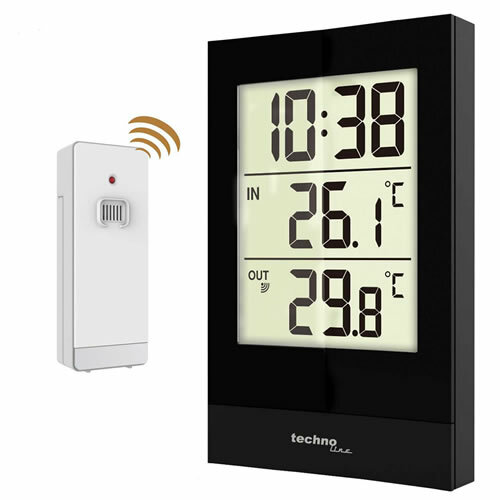 The Technoline WS 9575 temperature station with clock clearly displays both the indoor and outdoor temperature via the included wireless temperature sensor. Sleek design with modern piano black surround and a clear no nonsense display. The Technoline WS-9575 lets you see how cold it is BEFORE you go out! The temperature can be set to display in either Celsius or Fahrenheit and the clock can be set to display the time in either a 12 or 24 hour format. The display also has a Minimum and Maximum feature which records both the highest and lowest temperatures recorded since the last time the feature was reset which can be useful for some users. The indoor display is powered by 2 x AAA batteries and the wireless temperature sensor is powered by 2 x AA batteries. Please note that batteries are not included. The indoor display (85 x 135 x 17mm) can be either wall mounted or table standing.